In the heart of the popular Amalfi coast in Italy lies the small seaside town of Vico Equense. 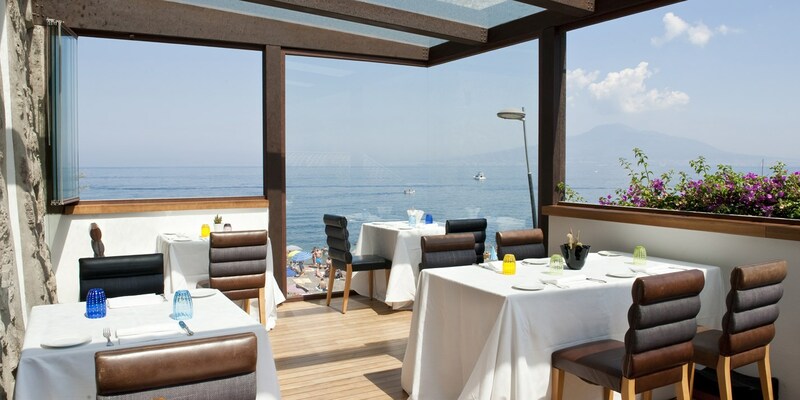 While perhaps not as well known as its more famous neighbours (which include Sorrento, Naples, and Mt Vesuvius), Vico Equense offers visitors a unique dining experience at chef Gennaro Esposito’s Torre del Saracino. As if showcasing both the coastal location and town’s history, the restaurant itself is perched on the beach in a 1,300-year-old watch tower – a legacy from the Saracen incursions along the coast in ancient times. Framed by both the mountains and the sea, the tower forms part of the impressive landscape of the historic town. In contrast to its historical surroundings, the restaurant interior offers diners a modern and elegant experience. The main dining room is complemented by an outside terrace overlooking the pebble beach, with floor-to-ceiling windows to make the most of the impressive vista. 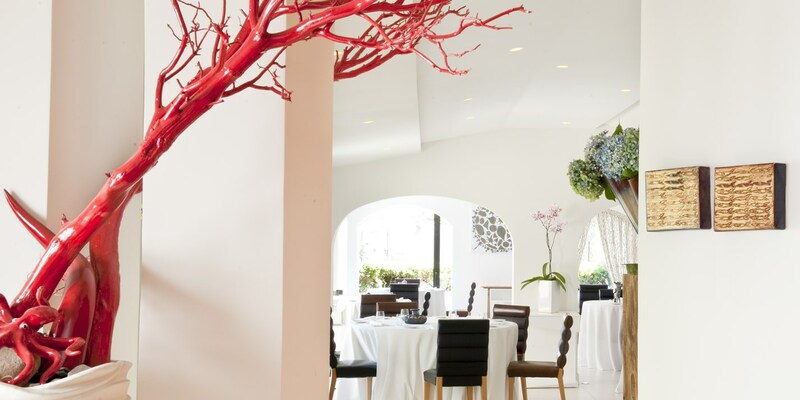 Clean, white decor is accentuated with red coral branches, in homage to the extinct red coral which used to form a major element of the Amalfi coastline. Connected to the dining room is a lounge area where guests can relax in stylish surroundings, with the exposed stone walls of the tower contrasted against a mix of modern art, furnishings, and even a state-of-the-art sound system. Opened in 1992 when Gennaro was a young man of twenty-two, the restaurant now has two Michelin stars behind it, with praise given for both the inspirational Mediterranean cuisine and the spectacular location – indeed, many diners choose to arrive by boat. The location itself plays a key part in the menu, where local fish and seafood often have a starring role; dishes of Mullet stew and dumplings, Cuttlefish and mackerel mille-feuille and the chef’s signature Ricotta soup with red mullet fillets spring to mind. To experience the best of the local produce on offer, there are three different tasting menus to choose from: the Cirio menu, Salvatore menu, and chef Gennaro’s own eleven-course menu. A constantly changing array of fresh, local produce on the menu requires a suitably flexible wine list to match, with many of the tower’s lower levels home an extensive and eclectic wine cellar. 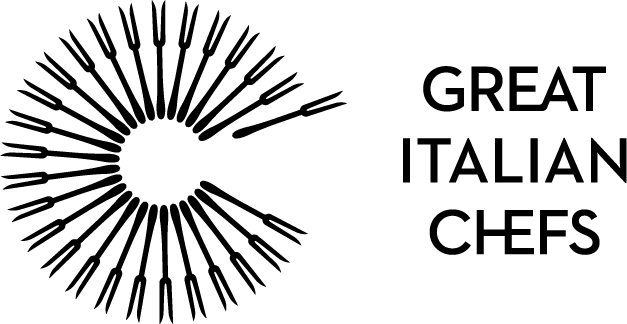 Wines from all over Italy are given pride of place, representing both classic vintages as well as artisan and niche winemakers, although there is a good selection of other European and new world varieties. The wine list is something Gennaro has taken great care over and invested a lot of research into understanding, offering both knowledgeable advice and choice for the customer. Creating the underground wine cellar required an extensive renovation project, not only to ensure the historical features of the building were kept intact, but also so the wines could be stored at the correct temperature and humidity. The tasting menus are named after two influential collaborators of the restaurant, Cirio and Salvatore, who have been a part of Torre del Saracino since its inception. The watchtower, Torre di Caporivo, would originally have been built to protect the coastline and surrounding villages from sea attacks from pirates and marauders. The Amalfi coast has a network of around thirty existing towers as a legacy from this coastal defence. 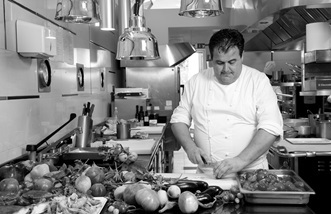 Having run his own restaurant for the last twenty-three years, Gennaro Esposito has had a remarkable career rooted in his hometown of Vico Equense. Working with Michelin-starred greats and earning two stars for himself, these achievements have only strengthened his passion and resolve to achieve new culinary heights.